Part dramatic history, part eerie ghost stories, part a study of marketing genius, and part a celebration of restaurant excellence, this cookbook by author and culinary historian Poppy Tooker masterfully combines all the myriad strands that fill the rooms of Tujague’s beautifully restored establishment into a whole cloth of foodie lore. In a continuation of the research begun for her first project with Pelican, Mme. 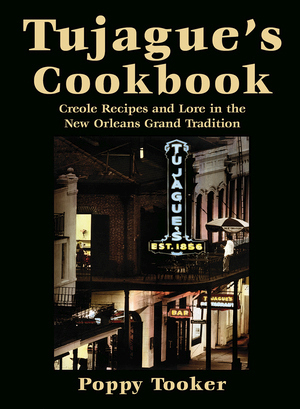 Bégué’s Recipes of Old New Orleans Creole Cookery, Tooker focuses on the second-oldest restaurant in New Orleans with its more-than-a-century-old tradition of serving excellent, fresh Creole cuisine in the heart of the French Quarter. More than a cookbook, this foray into history offers food and beverage recipes from the 1850s to today along with memorabilia from the restaurant’s archives and stunning modern photographs from Sam Hanna and Louis Sahuc. The dramatic story of the successful effort to save the restaurant from a possible sale is included, as are authentic dishes and drinks celebrating the oldest standup bar in America and the menus that created the international tradition of brunch and fed millions throughout the years. No longer will this grand lady slip into the mists of time. Poppy Tooker is passionate about food and the people who make it. She hosts the popular weekly radio show Louisiana Eats! Her classical training and love of New Orleans cuisine has been recognized globally through her participation in various documentary projects, and she competed on Throwdown with Bobby Flay, where her seafood gumbo was deemed better than his. The International Association of Cooking Professionals recognized Tooker with their first Community Service Award, and Southern Living magazine named her a Hero of the New South. A writer for many publications, Tooker informs readers on the importance of reviving foods that are pivotal to the Louisiana and New Orleans culture. Her previous book Louisiana Eats! : The People, the Food, and Their Stories, a companion to her radio show, received the Literary Award of the Year in 2014 from the Louisiana Library Association. Tooker lives and cooks in New Orleans.